System building: The phrase sounds excessively technical and boring. It's what computer geeks do in their dark, damp basements. Audiophiles know all about system building, however -- the mating of speakers with electronics and wires to effect a musically worthwhile whole. But for too many of them, building a system in endless fashion has become the point of being an audiophile: to put speaker A with amplifier B and CD player C and find out what it all sounds like. Bah! What about the music -- the real reason all of the hardware exists? Do these people listen to more than demo cuts and test tones? This isn't a rhetorical question. With some of them, I honestly don't know. Philip O'Hanlon, the US distributor of Luxman electronics and Vivid Audio speakers, knows what it takes to build a great audio system. He has two well-wrought collections of components in his palatial home. But more than anyone I know in the business of selling audio hardware, Philip is keenly focused on the software. His musical tastes are incredibly diverse -- from classical chestnuts to hip-hop, and everything in between. His collection of CDs, SACDs, DVDs, LPs and reel-to-reel tapes is immense, occupying more space than some of us have allotted for our entire audio systems. Philip is like a bloodhound when it comes to finding music that's worth owning, generously sharing the fruits of his compulsive research with like-minded musical explorers. And if what he unearths sounds good too, all the better. Philip and his family live in San Juan Capistrano, California, waking each morning to the sort of sunshine, sea breeze and greenery that vacationers fantasize about. He's a mile or so from the Pacific Ocean and up the road from Dana Point, where AIG executives held a winter retreat after securing $85 billion in funding to keep their company afloat. Needless to say, this is a gorgeous piece of the earth, and one that's especially simpatico with listening to great music, the noise of gardeners going about their work notwithstanding. Before I visited, I had seen pictures of Philip's voluminous main room, its 30' ceiling held up by rustic wooden trusses, but we started the audio tour in the office Philip shares with his wife, which is rather sizeable as well. 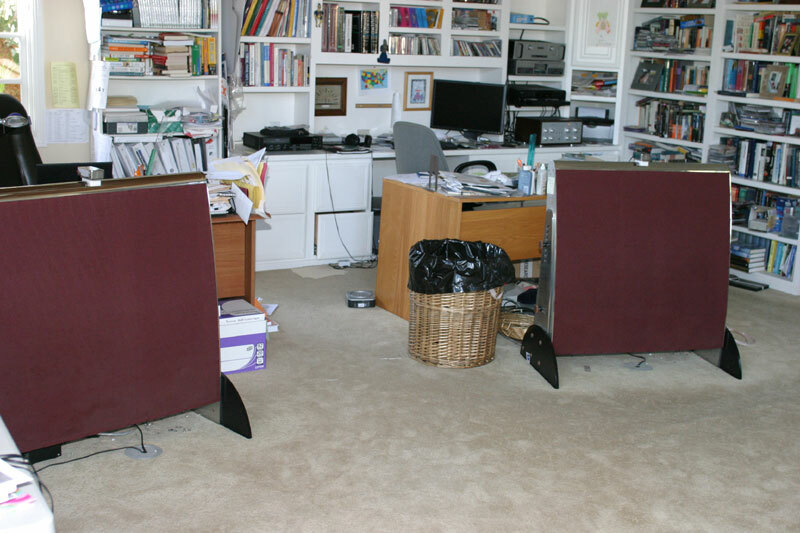 In it are a pair of desks, various pieces of computer equipment, packed bookshelves, piles of CDs, and a system that includes Philip's audio pride and joy: a special pair of Quad ESL 57s. What's so special about Quad '57s? Everything about this pair, which retains the '57's squat, rectangular shape but looks nothing like any pair you've ever seen. 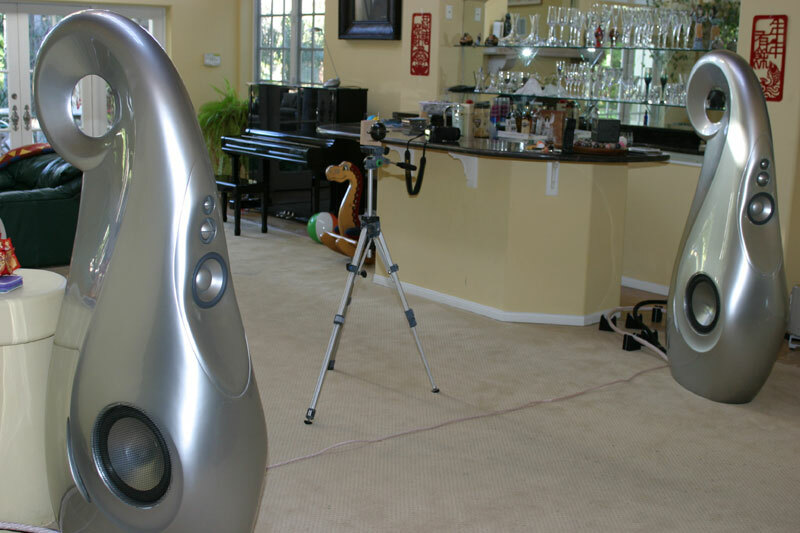 The frame of each speaker, often the cause of unwanted resonance, has been replaced with a new one made of heavy stainless steel and Delrin. 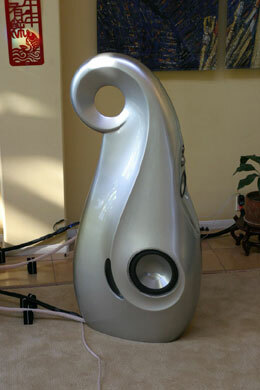 These add considerable rigidity and mass to each speaker. The crossovers are Peter Walker's first iteration with no protection circuitry, because, according to Philip, they simply sound best. 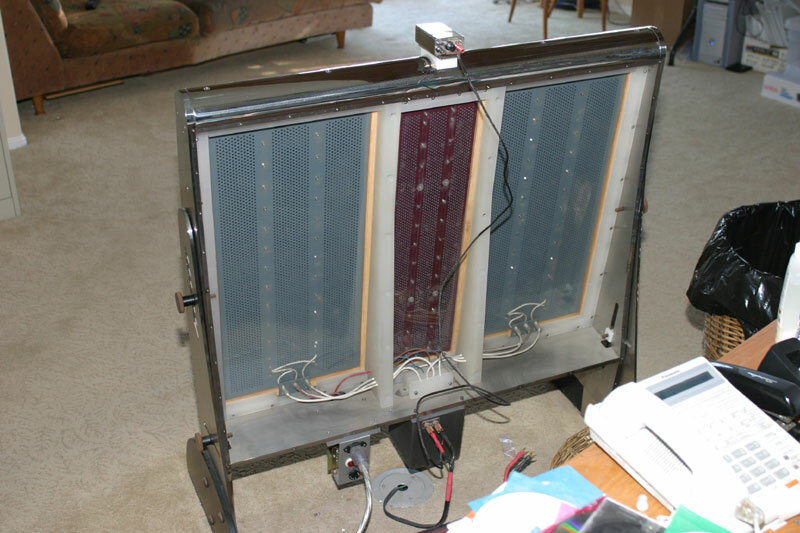 On top of each speaker is mounted a Townsend super tweeter whose output begins at 12kHz, and around back IEC inlets were added so Philip could experiment with power cords. His choice the day of my visit was a pair of Shunyata Research Diamondbacks. Philip's office system. We should all be so lucky. All told, these ESL 57s would cost $20,000 to replicate -- if it could even be done, given that all of the machined replacement parts were made as one-offs. Philip has hit upon a very refined partner to drive the speakers: a Luxman SQ-38u integrated amp ($6000), which is the 11th generation of a vintage design that Luxman introduced in 1963. Like its predecessors, the SQ-38u uses EL34 output tubes and includes a MM/MC phono stage; unlike earlier versions, however, the SQ-38u is fully remote controlled. The source was a discontinued Sony CD changer, the C555ES, whose sound Philip likes. Interconnects and speaker cables were from Shunyata Research and the same vintage as the Diamondbacks: not brand new, and chosen for their performance with the electronics and speakers. Behind one of Philip's highly modified Quad ESL 57s. The sweet sound of the integrated amp, with its EL34s, was nothing but positive in tandem with the astounding midrange transparency of the Quads. Even very good speakers will sound smeared and blurry through the mids in comparison. These Quads also acquitted themselves nicely in the bass, which had unexpected heft, even if it didn't go incredibly deep. What the speakers didn't do was cast a believable soundstage. They are too broad to disappear and too close to the floor to present a realistic perspective on the music. But no matter -- this was a presentation about where the music lives, in the midrange, and it was easy to revel in the directness of that. As I sat there, I daydreamed about having a pair of Quads that sounded like Philip's. You might do the same thing. I played cuts from each of the CD-R samplers I'd brought with me, and we listened here for quite a while. So when we moved to the big room, I had the sound of that midrange firmly locked in my head. This is exactly what Philip wanted, as he admits that the Quads are his personal standard for midrange transparency and purity. I hesitate to call Philip's other system his "main system," because I suspect he spends quite a bit of time listening to his Quads, but it is nonetheless quite a contrast from the conglomeration of audio gear in the office. Instead of a medium-power tube integrated amp, the big rig is built around a pair of solid-state monster amps. And whereas the Quads certainly have a midrange-centric presentation, the large Vivid Giyas are truly full-range speakers that, based on what I heard, don't favor any frequency band over another. 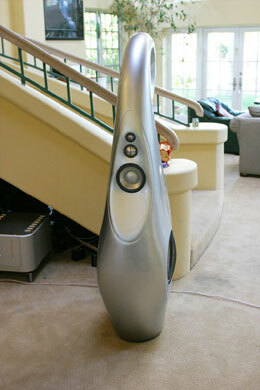 No speaker looks quite like the Vivid Audio Giya ($58,000 per pair). 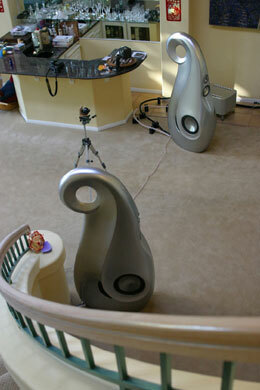 The tripod in between the speakers holds the Vibratron for Synergistic Research's Acoustic ART system. 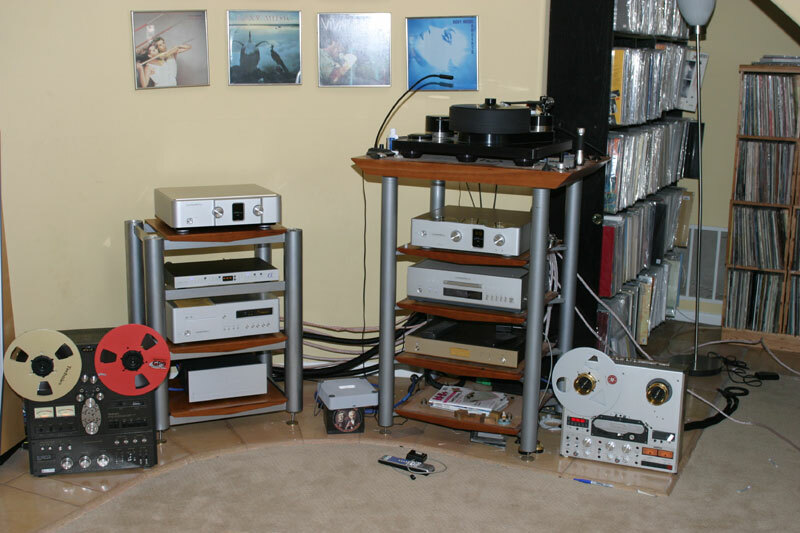 A pair of Luxman B-1000f monoblocks ($53,000 per pair) drove the Giyas ($58,000 per pair) via pairs of Synergistic Research and Shunyata Research speaker cables. The preamp was also from Luxman, the C-800f ($16,000). There was an abundance of sources, both digital and analog. There were Luxman multiformat digital players, the DU-80 ($10,500) and new D-08 ($14,000), with a Luxman E-1 phono stage ($3700) boosting and equalizing the output coming from a carefully chosen analog setup: a Brinkmann Balance turntable with Brinkmann outboard power supply and tonearm, and a van den Hul Colibri cartridge. We also listened to modified ReVox (by SonoruS) and Technics (by Tim de Paravicini) reel-to-reel tape decks playing some of the amazing Tape Project tapes as well as a couple of one-of-a-kind tapes that Philip had wrangled from his friends in the music industry. It's good to have friends in the music industry. Philip's electronics -- and some of his music. The room also plays a role here. It's 24,000 cubic feet, opening above to a 6000-cubic-foot balcony. The true cathedral ceiling allows for some of the outside to come inside -- literally: A potted tree is growing in one corner. The system is set up at one end, leaving 26' of space behind the speakers. We sat 12' from the front of the speakers, looking down the length of the 40' room. Near the left speaker is a staircase that leads to the main level of the house. The room's dimensions and layout seem less than ideal, yet Philip has turned it into a very good space in which to hear the top-shelf equipment he distributes, with help from Synergistic Research's Acoustic ART room-treatment system. Philip takes an emperical approach to the unconventional ART system: "How it all works, I have no idea, but I am happy to use it. I follow my ears." Boundary issues are essentially nonexistent in this room, and generating low bass is no problem. Whereas the office system was about subtle musical gestures and that astonishing midrange, this system had no limitations and many obvious strengths. The Giyas delivered orchestral music with enormous sonic presence, yet each instrumental group was easy to pick out and follow. Bass drum had extraordinary power and low-end reach, but its definition, attack and pitch were better than I had ever heard. The midrange didn't disappoint, even following on that of the Quads. It was uncolored and lively, each vocal inflection well defined and delineated. This system didn't present a romantic or euphonic view of the music. Instead, it was about absolute honesty, though it didn't surrender the music's intrinsic beauty to this goal. I also have a very good room for such speakers and electronics, and during his visits to deliver or pick up review products, Philip has remarked more than once that the Giyas would realize their sonic potential in it. After hearing the Giyas at his house, I gave in to Philip's subtle nudging and agreed to write about the speakers later this year. Before I left, Philip insisted on playing me "something you'll recognize." When I visited Brian Ackerman of Aaudio Imports, the distributor of various European audio brands, he did the same thing. Brian chose a Dean Martin number that I had never heard, "I'll Buy That Dream," and by coincidence Philip chose a cut by one of Dino's Rat Pack cohorts. Suddenly the opening bars of "The Best is Yet to Come" rolled out of the Giyas, followed by "the voice" -- Sinatra. Has anyone of adult age not heard this version of this song? The Giyas displayed the texture of Sinatra's scotch-tinged middle-aged voice -- deeper and more relaxed than in his crooner days, rife with expression and gravity. When he sang the chorus, all I could do was grin. This is what system building is about: Sinatra's voice making you believe that good fortune is coming your way. I look forward to hearing the Vivid Giyas in my room and testing that claim.